This is an unusual combination: a service area which also describes itself as "Cumbria's leading family day out". The petrol station attempts to blend in with the environment. 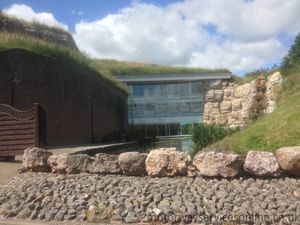 It opened in 2000, on the site of the former Redhills Limekilns, with some of the former limekilns incorporated into the building design. The amenity building and petrol station share one large, grass roof, which the entry road dives under. 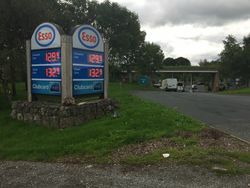 It is also very close to an unsigned Burger King, Travelodge and former Little ChefHistory site on the westbound A66, just east of here.